I just came back from ten days in Hobart. Hobart is a strange place. It’s summer… but it’s cold. The sun is out until 9pm (it’s like that Insomnia movie with Robin Williams as a psycho)… but it’s cold. For a Brisbanite, it felt like the middle of winter. Which is confusing… but it also means one very special thing. While everyone was telling me how it wasn’t like our summer and I couldn’t just wear t-shirts and I’d need to take a coat, all I was thinking was: DARK BEER. Brisbane weather has been over 30 degrees since about September. And while that hasn’t completely stopped me from drinking dark beers, it certainly hasn’t been the ideal temperature for it. For me, dark beer and jeans are the same—I’d like to drink/wear them all year long, but in Brisbane, that’s really difficult to do. So I drink/wear them for as long as I can, until I feel I absolutely must switch to non-dark beers/shorts. Then I endure the white-hot heart of summer until I can drink/wear my favourites again. All this to say: leaving Brisbane in late November (35+ degrees) to visit Hobart (3-23 degrees) was a balm for my dark-beer-craving soul. I can see why everyone liked it so much. 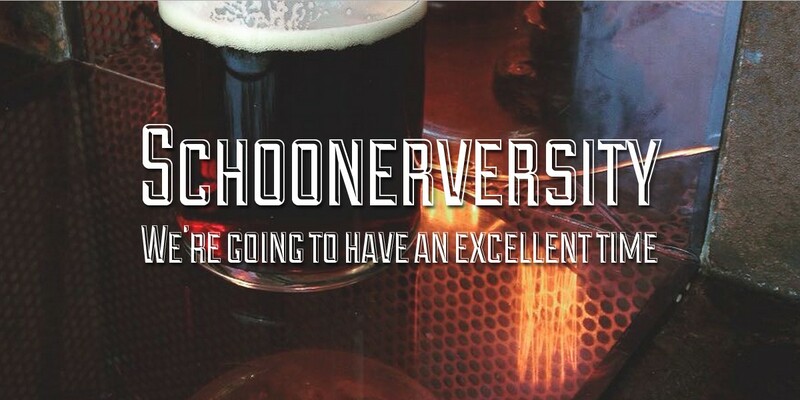 It’s set out like a house… except a house that revolves around the drinking of good beer. That’s my kind of house. They have an astroturf beer garden (and plenty of people were sitting out there freezing, even though there was room inside… you Tasmanians are crazy). They even have a bus. A full-size, bona fide, wheels-on-the-bus-go-round-and-round council bus, decked out with seating and tables for all your beer-drinking needs. (Although I’m fairly certain the wheels no longer go round and round.) And they play bingo in it once a week. Why wouldn’t you? A big ol’ pint of Pirate Life Stout. So. Preachers. Go there. We did. Twice. The next time we went a-hunting for a watering hole, it was along the waterfront at Salamanca. And while there were several venues with decent beer options, we couldn’t go past Watermans Beer Market. The name says it all. 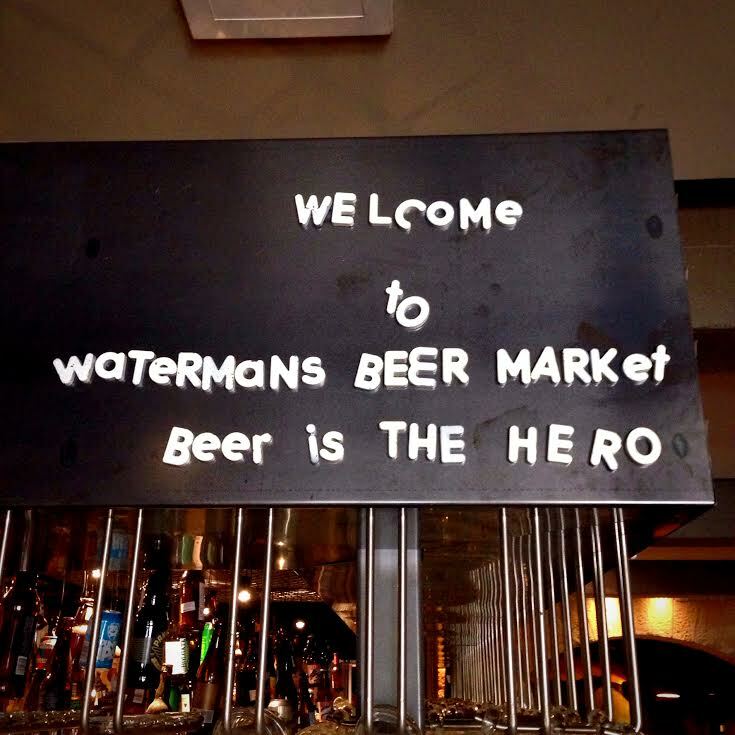 Watermans Beer Market – Beer is the Hero. So we headed in. The walls are all those different-sized-stone-brick type things, and there’s plenty of beaten wood, so it’s gives the feeling of being in the wine cellar of a castle. We kept exploring out the back, and found a smallish astroturf beer garden (ah Hobart, you seem to be having a grass-growing problem) with a secondary bar. A quick peek at the impressive bottle stock in the fridges there revealed a bottle of La Sirène Praline for $20. Score. What a way to start! Before we could do anything about it, the bartender from inside came out and brusquely informed us that the beer garden was closed, and held the door open for us like he was waiting for the dog to come back inside. “Sorry, we’re just looking at the bottle stock,” we said. Fair enough. We headed back in and up to the bar. “So… what sort of thing are you after?” he asked. Call me a douche, but I got a perverse pleasure out of seeing the slow spread of embarrassment creep across his face. Bet you feel a little bit like a dingus, doncha? Anyway, after all the back-and-forthing, that last bottle of Praline turned out to be a frother, so we had a good chat with the guy about the taps and ended up going straight to the tasting paddle. And of course, any paddle is amazing when it includes Modus Operandi Former Tenant and Sierra Nevada Bigfoot. I say, Tasmania, summer may not make it across the strait to your shores, but I’m certainly glad Former Tenant does. Mrs Schoonerversity is mucho happy with our tasting paddle. Wow. Someone had a very good week… followed by a very bad week. Towards the end of our holiday, we’d been to some good bars, but were yet to check out a Tassie brewery. Which is completely unacceptable. 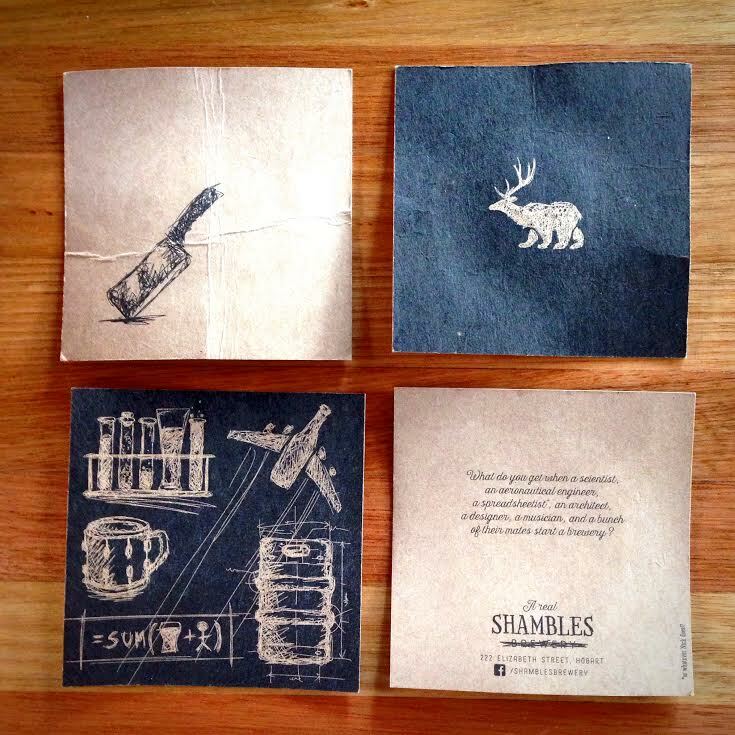 With a little bit of research, I decided Shambles Brewery was the best looking place in walking distance of our accommodation (I may or may not have made that decision based solely on the fact that their bowls of hot chips were only $4). It’s nestled on one of the main streets of town beneath a huge red sign that says ‘MEATS & MORE’. We might have missed it if it weren’t for the astroturf out front (seriously Hobart, I think we need to talk). 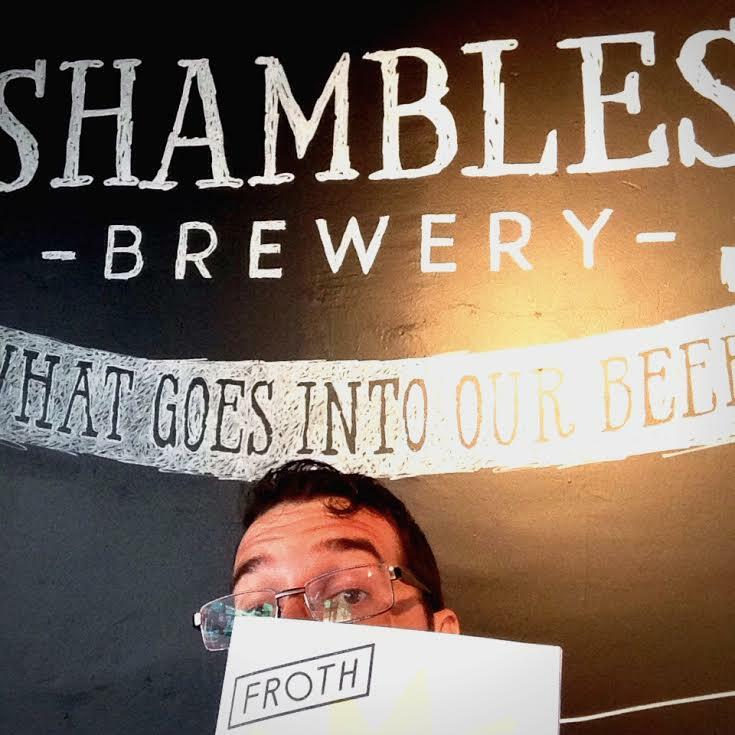 A Brisbane beer blogger in a Hobart brewery reading a Melbourne beer magazine. Unfortunately the kitchen wasn’t open yet, which brought tears to my chip-loving soul, so I began the grieving process with a tasting paddle. 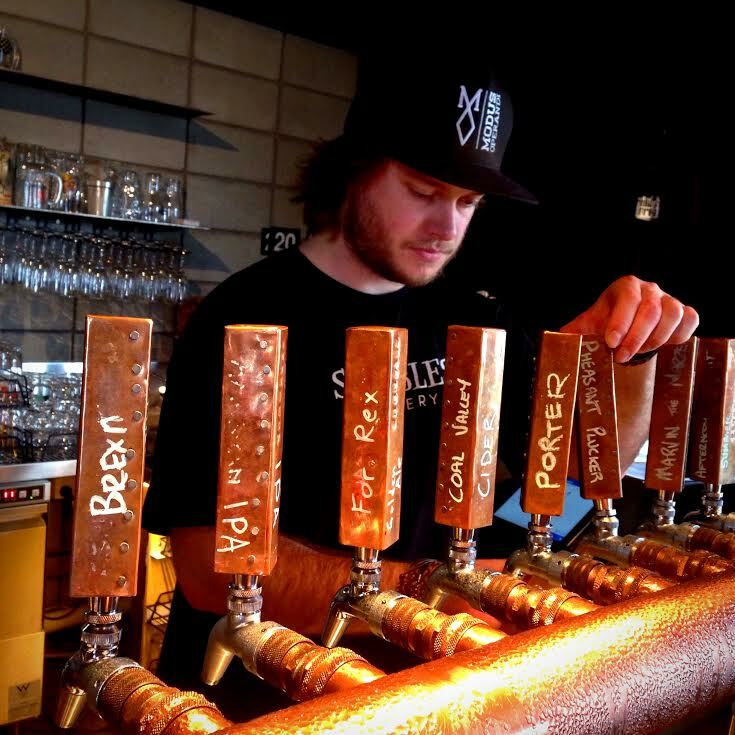 We picked all of the 6%+ beers (of course), and were not disappointed. The Pheasant Plucker (I assume they enjoy hearing drunk people order that) was a saison but with some boozy backbone, which suited me just fine. The Marvin the Marzen introduced me to a new style, which is always fun. I didn’t know what the crazy a ‘Marzen’ was before this, but apparently it’s a seriously sweet malty German lager. Would do again. Dances with Hops was a solid American IPA—always a good sign when a brewery’s core IPA isn’t boring. The Barry White Robust Porter drank like a stout—deep, rich, and toasty, with a crema-like chocolatey head. For a brewery that only opened at the beginning of the year, they’re certainly pumping out some quality stuff. Also they have pictures of a bear/deer crossbreed. (It’s a Beer! Get it????????!?!?!!?!?!???). Which looks awesome but raises a few questions. Do they know Anderson Valley already has that? Did they come up with it separately, or just figure we can have one brewery per hemisphere with a Beer in the branding? This is where my brain goes when it’s not given chips. Hobart, your weather and your sunlight confuse me. (As does your inexplicable abundance of astroturf. And ice cream stores! WHY ARE YOU EATING SO MUCH ICE CREAM WHEN IT’S COLD?!). But you made this dark beer lover happy. 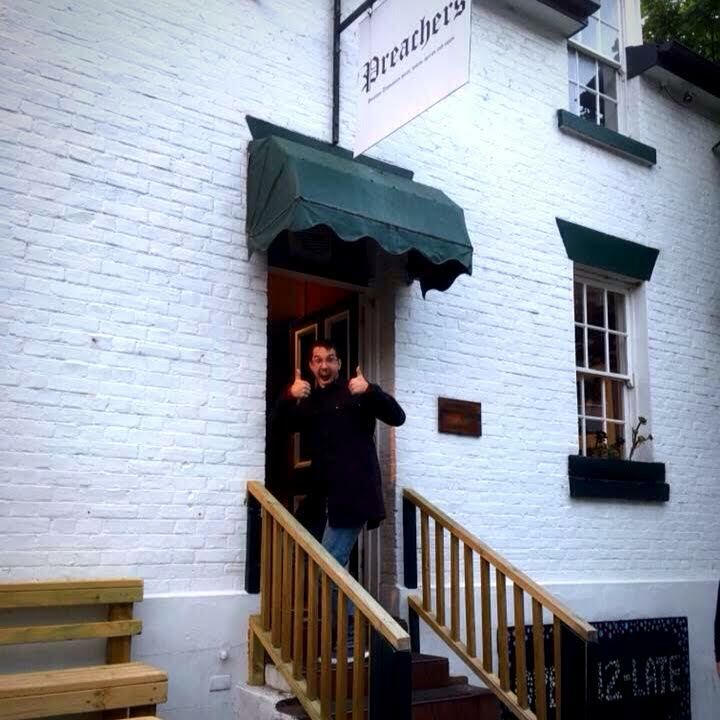 Cheers, Hobart (Hobeert?). 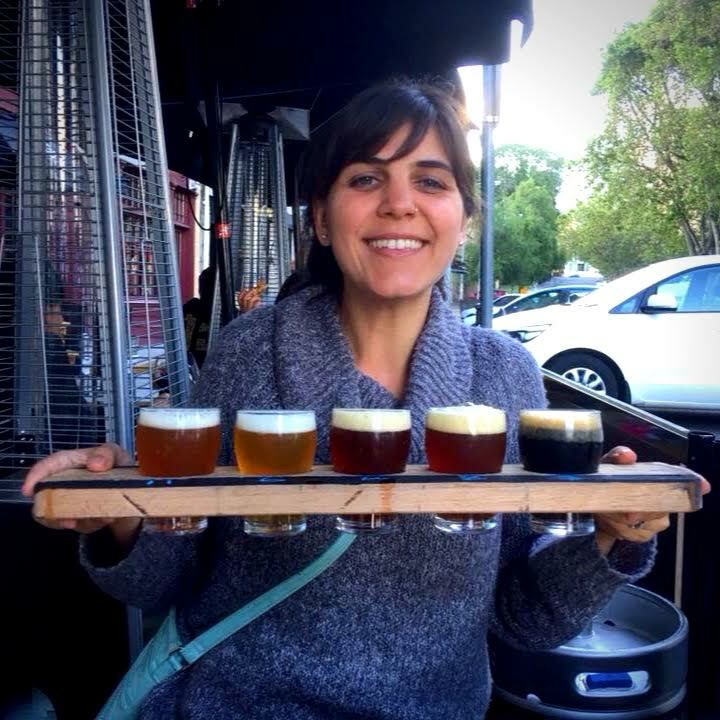 Did I miss some amazing beer places in Hobart that I should have checked out? Let me know in the comments. 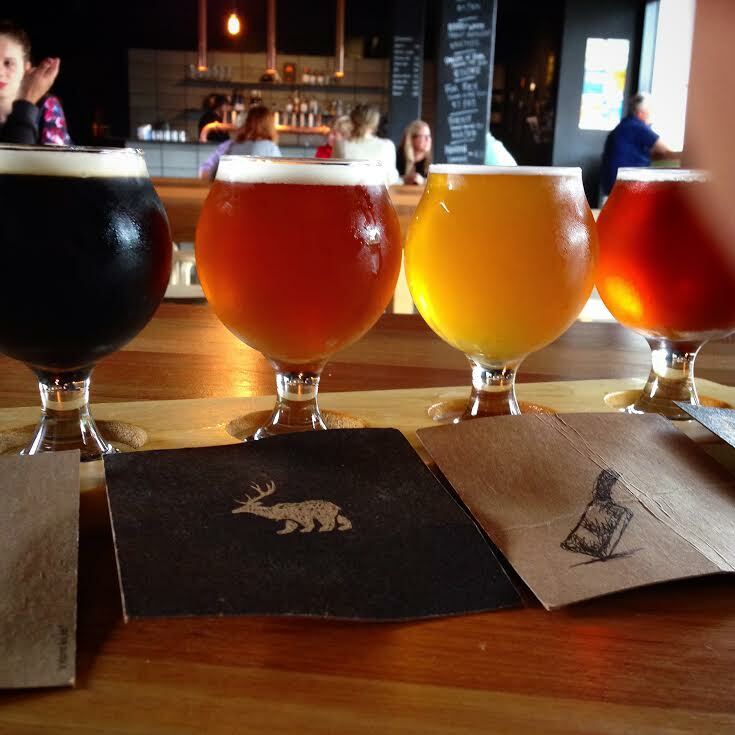 In my research the American Beer seems to comprise a Bear with antlers, whereas the Tasmania Beer is much more a hybrid Deer/Bear creature. Interesting. 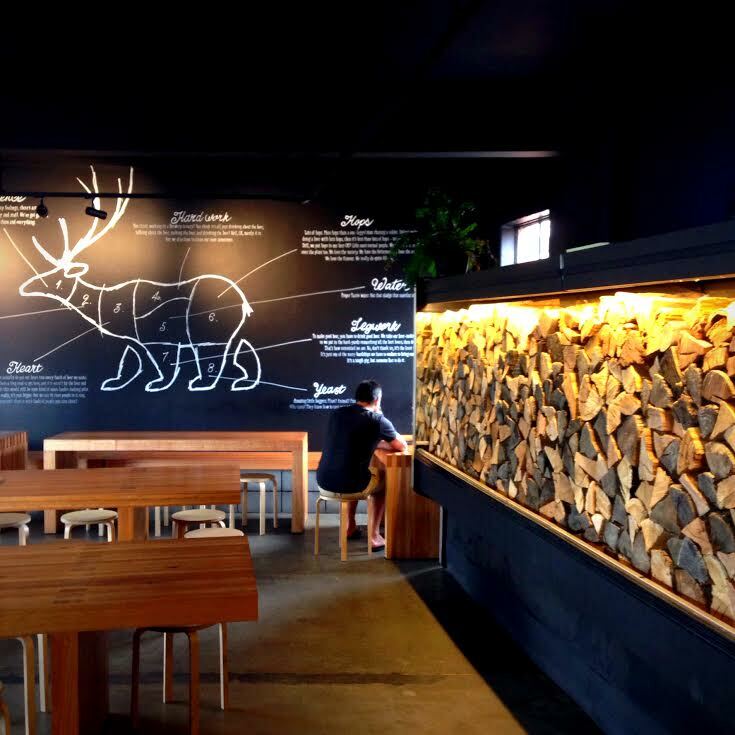 That’s some good research, Stu–the Tasmanian Beer appears to have a bear’s body and a deer’s head. Although, just to shake things up a little–just around the corner from Shambles, I saw some stencilled graffiti of an American Beer. Although I don’t expect Hobart to have better weather than Brisbane, I kind of want to go there less now. For some reason, I always thought that all of Tasmania just gets sunny warm weather throughout the year, just because it’s closer to NZ. 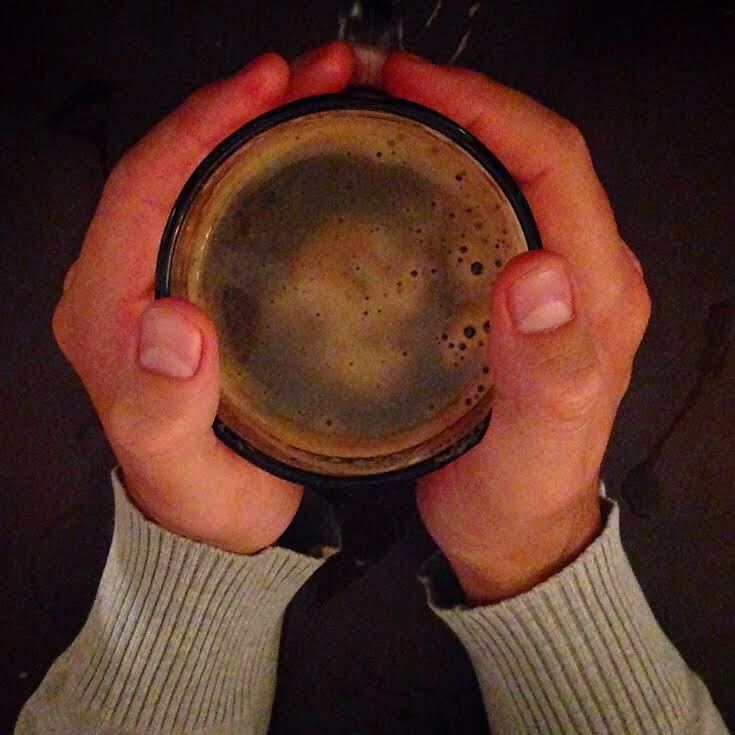 But… cold weather means dark beer. And dark beer is amazing. Ergo: cold weather is amazing!